For the upcoming first hardcopy issue of the FAST Celadon, we decided to include an article on Dr. Pervez Hoodbhoy. Hence, to make the article something worthwhile, Zubair and I decided to interview him personally. Today at 1:30pm, we went to his office along with our camera person Waqar Ul Haq. For a person with so many qualifications and awards, we found Dr. Hoodbhoy a rather simple person with a not-so-fancy office. He welcomed us warmly and talked to us without any rush whatsoever. Since Dr. Hoodbhoy is more than just a physicist, we were able to talk to him on various issues concerning the world today. Before talking to Dr. Hoodbhoy, I was a big fan of Dr. Atta Ur Rahman. I may still be a fan, but Dr. Hoodbhoy gave us so much material to think otherwise. All his arguements were supported by facts and his extensive knowledge. Even though it would be unfair to start thinking negatively about Dr. Rahman based purely on this discussion, the points made are all worthy of attention. 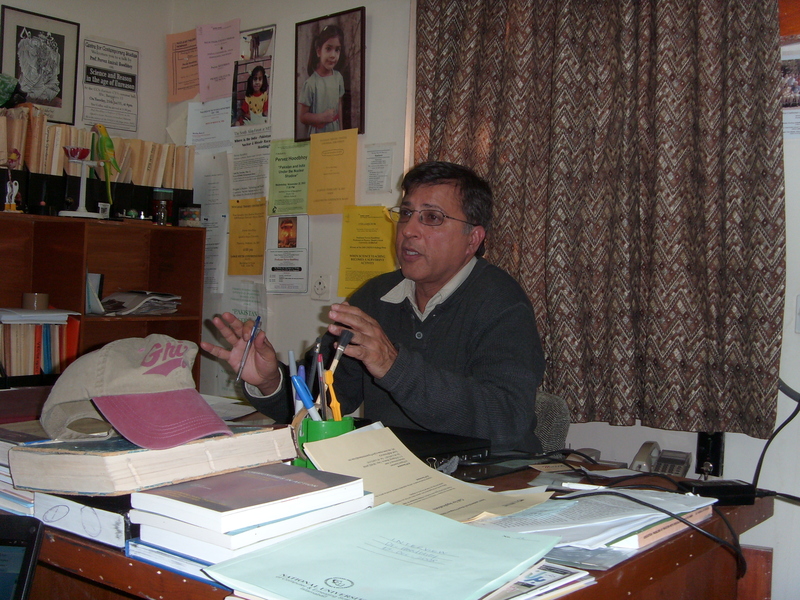 Dr. Hoodbhoy criticised the sudden increase in the number of PhD’s in the country. Dr. Rahman takes pride in increasing the number of annual PhD’s from 150 to 1500. The first criticism was the compromise on quality for sake of quantity. Increasing the number of public sector universities under Dr. Rahman certainly increased the number of students, but greatly reduced the quality. Dr. Hoodbhoy was of the opinion that more spending should have also been done on existing schools. At the same time, HEC sponsored students going abroad for studies was deeply critisized. For one, Dr. Hoodbhoy felt that a 40 percentile on GRE is a shameful critaria of selecting potential PhD candidates. He believed that incompetent people were able to make use of the HEC scholarships. These funds could have been used in a better place. Other projects like the opening of 9 European universities in Pakistan were a hoax as well. Dr. Hoodbhoy found it stupid to sign such contracts with European countries at a time when people from the West rarely visit Pakistan. A lot of money was invested in these universities, yet none of them have taken shape ever. Moreover, HEC allocated Rs. 400 million for a Pelletron Accelerator for QAU. He called Dr. Rahman immediately to inquire about the purchase of this obsolete device. Dr. Rahman said that Prof. Riazuddin signed the PC1 and approved it. Later Prof. Riaz publicly claimed that he was pressurized into signing the approval. Nevertheless, the device has been installed and is locked up on the QAU campus. So far, no use has been found for this purchased item. Add to that, another such device was recently ordered for Government College Lahore. Apart from HEC, Dr. Hoodbhoy talked about several other issues ranging from the Nuclear issue to the Kashimir problem. We talked about the current situation in Pakistan and the future prospects of the country. He confidently and openly discussed every issue. His patriotism was obvious. The urge to work for the country was embedded in him.Yet, he sounded full of frustration for the incompetent leadership we have today. Indeed a very interesting conversation. Hopefully the article will be up soon too!